We had a fabulous group of visitors for lunch the other day! Our friends from PACE Center for Girls stopped by, along with the “winners” of their QUACKtastic Quacky Challenge. 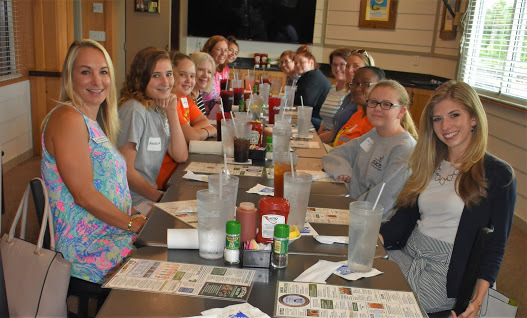 The PACE girls who earned 100% attendance during the month of June were invited to enjoy lunch with the “winners”. It was wonderful seeing the teams interact with the PACE girls in a close setting. Learning about their hopes, dreams, and aspirations for the future were awe-inspiring. We were honored to host the lunch and have the chance to support young women in our community. It was a truly remarkable group and we can’t wait to see what they will accomplish in the future! For more information about PACE Center for Girls of Manatee County, visit them online. Categories AMOB in the CommunityLook Who Came To Dinner!